Although the federal income tax system was designed and intended to make up for revenue losses due to tariff reform, it quickly became a primary means to fund the programs of our bloated federal government. The Constitution provides that Congress is authorized to tax and spend for its constitutional purposes, but the reverse is also true… it is NOT empowered to tax and spend for unconstitutional objects. As we all know, the “General Welfare” clause, as well as the “Necessary and Proper” Clause, are not separate grants of power. We need to return to a taxation system similar to the one established by our Founding Fathers. They did not penalize productivity through taxes the way we do today. They had no Internal Revenue Service. They believed in minimal taxation. They didn’t believe in income taxes, which were prohibited by the Constitution (“unless in proportion to the census or enumeration before directed to be taken”) – that is, unless such taxation was uniform and equally applied. They would have been horrified at the enormity of tax schemes crafted to plunder Americans’ income and property in order to fund a bloated government – income taxes, employment taxes, capital gains taxes, estate taxes, corporate taxes, property taxes, Social Security taxes, gas taxes, etc. It was excessive taxation like this that drove our founding patriots and Founding Fathers to rebel against Great Britain in the first place. They did not believe in paying export taxes, which also were prohibited by the Constitution. But they did believe revenue to fund the responsibilities of the federal government should be raised by taxing imports. The Founders believed in free trade within our own borders and a system of tariffs on imported goods. That’s a system that makes sense. It is a system designed to preserve individual liberty and encourage productivity (through no income taxes and no discouragement of domestic production through export taxes) while choosing to keep taxes as painless as possible (through taxes on foreign imports). And it doesn’t require an IRS to run it. The Internal Revenue Service was started in 1862 – nearly 100 years after the Revolutionary War – as the Bureau of Internal Revenue. It was created to collect the income tax that President Lincoln and Congress imposed on the states and territories of the Union to pay for the costs of the Civil War. The Revenue Act of 1862 was allowed to expired 10 years later, but was revived in 1894, although temporarily. It was struck down by the Supreme Court as unconstitutional in 1895. In 1913, Congress was able to devise a scheme (“Soaking the Rich”) to get around the “uniformity” requirements of the US Constitution with an income tax and that scheme became the Sixteenth Amendment. “Soaking the Rich” was an easy concept to sell to the states at the time. It soon became clear to anyone with substantial knowledge of the tax code that obtaining tax breaks for the wealthy would be a lucrative business. The tax lobbyists in Washington DC were born. Ever since the passage of the Sixteenth Amendment and the direct ability the federal government had to take whatever it needed from the income of its citizens and the value of their assets and property, the income tax has deprived families of their rightful earnings, restricted our liberties, and deprived our economy of money that could have been invested in productive enterprises. It has been a “dull journey” to this point in history – the 21st century – where it seems many things are free except us. Today the tax code is a complex, convoluted monstrosity of rules and exemptions. It is modified an average of three times daily when Congress is in session. It was modified a total of 579 times alone in 2010. Today the IRS is the No. 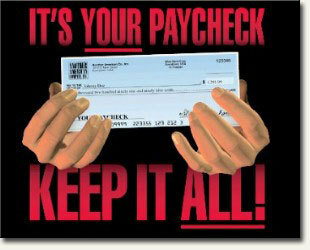 1 enemy of your pocketbook. Who doesn’t fear an IRS audit? It’s the only federal agency that considers you guilty until proven innocent. It can’t be overhauled or even reformed (Congress’ attempts have failed), and the power to audit is a powerful tool tyrants in government can use to silence, intimidate, and harass political opponents and enemies. In 1994, three Houston businessmen met for lunch – Jack Trotter, Bob McNair, and Leo Linbeck, Jr. As was common at their luncheons, they began to complain about the federal income tax system. But at this particular lunch, they decided to do more than just talk. They decided to try to do something about it. Each of them pledged $1.5 million as seed money to hire the best tax experts in America to identify the faults with the current federal tax system, to determine what American citizens would like to see in tax reform, and then to design the best system of taxation. With their initial investment of $4.5 million, Trotter, McNair, and Linbeck went on to raise an additional $17 million to fund focus groups and finance/fiscal studies, and additional research. The research was extensive and distinguished the Fair Tax from every other tax reform proposal ever put forward. January 2006, an additional $2 million was spent in research to make sure the Fair Tax was still the best tax replacement solution for our nation’s current economic situation and the results concluded that it was. It was then resubmitted in the 111th Congress in January 2009 as H.R. 25 (“The Fair Tax Act of 2009”). It would be nice for hard-working Americans to enjoy the fruits of their education, mind, creativity, labor, and investment and have the flexibility to use them in the best way they deem fit to benefit their own families, their personal pursuits of happiness, and their retirement. It’s time we had a system in which people didn’t have to figure out ways to cheat in order to save their money. No one is suggesting that we don’t need the revenue that taxes generate. We just need a system that is fair and aligns our government again with its purpose: to protect the “Life, Liberty, and Pursuit of Happiness” of every individual. The income tax and the IRS have perverted that purpose and have become instruments of wealth re-distribution and oppression. We protested against the king and the parliament of Great Britain over a 3% tax on tea. Our early colonists were wise enough to understand that the protest wasn’t really about the minute tax on tea but rather about the assault on individual liberty in general. As James Madison put it: “The people of the U.S. owe their Independence and their liberty to the wisdom of descrying in the minute tax of 3 pence on tea, the magnitude of the evil comprised in the precedent. Let them exert the same wisdom, in watching against every evil lurking under plausible disguises, and growing up from small beginnings.” The income tax is far more oppressive and offensive than the Tea Act. We don’t need tax reform. We don’t need Congress to amend or simplify the current Tax Code. We need it abolished. We need another tax protest and another tax revolution! The following resolution addresses the many benefits of the Fair Tax and how it will restore property rights and the free exercise thereof. The Fair Tax is a popular tax scheme that has become even more popular with the current IRS scandal and the growing population of Americans that contributes nothing to the revenue generated through federal income taxation. The Fair Tax plan replaces all federal income and payroll-based taxes with a national retail sales tax that is fair, simple, and understandable. Under this plan, no one pays any federal taxes on the purchase of basic necessities; yet it raises the same amount of revenue as does the income tax system. 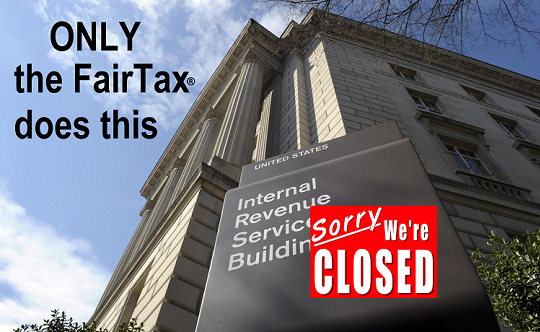 The Fair Tax Act of 2013 (H.R. 25/S. 122) is nonpartisan legislation that abolishes all federal personal and corporate income taxes, gift, estate, capital gains, alternative minimum, Social Security, Medicare, and self-employment taxes and replaces them with one simple, visible, 23% (inclusive) federal retail sales tax paid at the cash register. Individuals no longer file federal income tax returns and the IRS is eliminated through companion legislation. 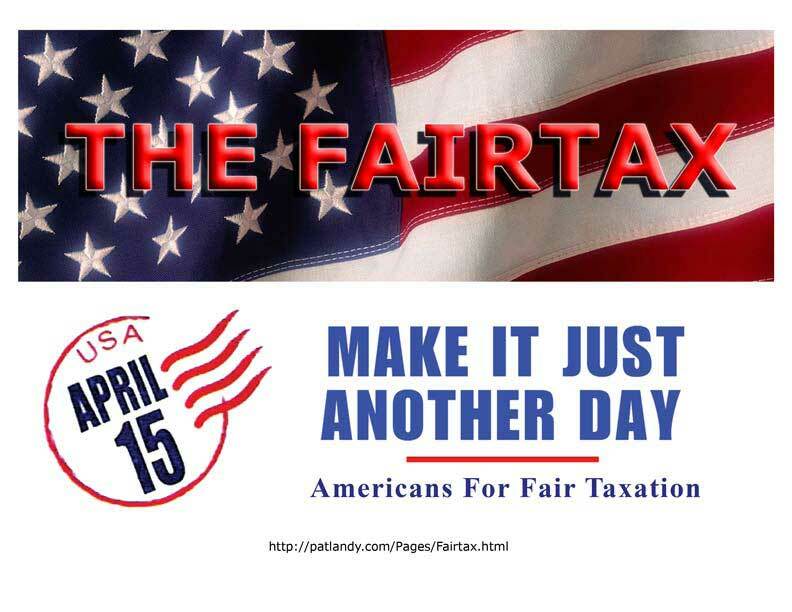 The FairTax applies to everyone in America, including illegal immigrants, foreign visitors (about 50,000 each year), and those who evade paying taxes under the income tax system. This innovative, extensively researched, grassroots supported tax system is a fair, efficient, transparent, and intelligent replacement of the frustrating, inequitable income tax system. Our current tax scheme allows the government to assess and tax one of the fundamental legs of our very freedom – our property….. the fruits of our mind and labor and one of our most sacred pursuits of solitude, privacy, and happiness. The Fair Tax, on the other hand, is a consumption tax and therefore fair, non-arbitrary, and non-destructive of freedom. Since it is not an income tax, the Fair Tax renders the Sixteenth Amendment useless (so it can be repealed and off the books forever!) and the IRS as well (so it can be defunded and dismantled). Under the Fair Tax, every American (irregardless of income earned or generated) can purchase essential goods and services tax-free up to the national poverty level through a tool called the prebate. A prebate would be a check from the federal government sent to every registered family at the beginning of each month to cover the costs of basic living. The amount of the prebate that each family would receive would be based on the U.S. Health and Human Services report of the Federal poverty level, estimated at the beginning of each year. This estimate would determine just how much money a family needs to meet their basic living expenses, and these expenses would be made totally tax free. 7. By eliminating the need for states, counties, municipalities and school districts to pay FICA, those entities would see significant increases in their available budget revenues. Resolved, that the ________________________ (group name) urges all representatives in both the NC and US Houses and Senate to publically declare their positions on the FairTax bills. This entry was posted in Uncategorized and tagged Fair Tax, graduated, income tax, IRS, national sales tax, progressive, resolution, Tax Code, tax reform. Bookmark the permalink. 5 Responses to Has the Time Come For Us to Switch to the Fair Tax? Diane Rufino, the problem is the entitlement addicted liberals that think government has a right to half of our stuff. Jeffrey, I think it’s part of the Saul Alinsky model (in his book Rules for Radicals) to divide Americans into the wealthy and the poor and to then vilify the wealthy and to accuse them of gaining their wealth by exploiting a privilege or by exploiting others. This way it makes it easier for the poor to believe they are entitled to their wealth and not to have any conscience in accepting it. Have you heard of Saul Alinksy? Have you heard of Saul Alinsky? Diane Rufino, only by name. Jeffrey, I wanted to follow up with my discussion of Saul Alinsky and how he likely plays a big part in today’s entitlement mentality. I am a permanent guest on a radio station in my part of North Carolina and today’s show actually touched on Alinksy. Here is a very short summary of what I talked about: I discussed how Saul Alinsky’s book, Rules for Radicals, has played out in the progression of our country towards a social state ( a state in which the government serves all the needs of the individual). In that book, Alinsky discusses the 8 levels of control that must be obtained before a true social state can be created and how to turn America’s “useless idiots” into “useful” ones in order to achieve that goal. The 8 levels of control are: Healthcare (control healthcare and you control people), Welfare (take control of every aspect of their lives), Poverty (increase the poverty level; poor people don’t fight back when everything they need to live is provided to them), Debt (increase the debt as high as possible; that way taxes have to be increased, this producing more poverty), Gun Control (remove the ability of people to defend themselves from government; that way government can establish a police state, if necessary), Education ( thought control), Religion (remove the belief in God from the government and schools), and Class Warfare (divide people into the wealthy and the poor and vilify the wealthy; this will cause discontent and make it easier to tax the wealthy even more to support the poor). How many levels have been obtained already? As you can see, the Progressives have done their homework, have embraced the Alinsky model, and have been successful at fundamentally transforming not only the character of a large segment of people in this country (from honorable, educated, and self-sufficient) but transforming the country in general. You’ll notice that the only level of control that progressives and liberals have not achieved is gun control. This likely explains why they are so eager and so aggressive lately in pushing for gun control. This is why they are so happy to turn each national tragedy (mass shooting) into a reason to take away the right to have and use fire arms. If you are a conspiracy theorist or a skeptic like me, you might even ask yourself if the recent rise in shootings isn’t the work of subversive elements in this country designed to bring about gun control. Certainly some of the recent shooters have questionable histories and many could have been prevented from getting guns except that the government dropped the ball in failing to put them on a watch list, failing to keep an eye on them when they WERE on a watchlist, failing to report them for mental issues, and simply overlooking information on file that SHOULD have prevented them from purchasing a gun. Diane Rufino, my preference would be for the Fair Tax. However, what is to be done with the idiots who claim that it only benefits the rich?